Low seat stool with original skate board. So that you can also use it as a side table or a simple decoration element to reflect at home your lifestyle and what you like. If you are looking for an original gift for a skater, this stool is a great idea, will surprise you and give a new and cheerful air to your decor. Skate stool with lots of uses so you can make the most of it. Its measures make it very easy to carry at home, so you can use it to support the feet when you are sitting on the sofa or to leave on it your Ipad, book or more. But to us one of the functions that we like most is to use it as a side table to leave the appetizer when friends come home. The color of the stool will give a touch of light to your decor and will be your first piece of furniture that reflects your passion for skateboarding. This stool is also a great gift idea for that family member or friend to whom you want to give him a big surprise. 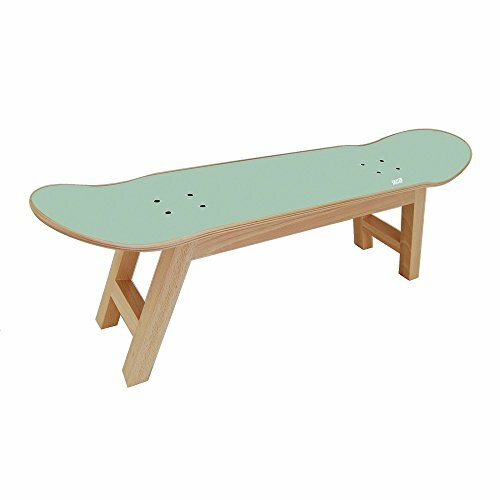 You can use the skateboard stool as bench, footrest, coffee table, side table.. Customize your home with furniture that reflect your lifestyle. This skateboard stool is made of high quality beechwood with a varnished finish legs. The impression skateboard is done with the ultimate printing tech, Hard Polypropylene digitally printed HD. Note that there may be variations in the color that you see on the computer screen and that of the final print. If you have any questions about this product by SKATE HOME, contact us by completing and submitting the form below. If you are looking for a specif part number, please include it with your message.